by Tom Banse Follow Northwest News Network March 14, 2018 9:43 p.m. | Updated: March 15, 2018 9:53 a.m. | Seattle, Wash. The Pacific Northwest’s beloved orcas will not survive unless humans do more to ensure adequate food and cleaner, quieter waters. That was one of the messages at a crowded signing ceremony in Seattle convened by Washington Gov. Jay Inslee. 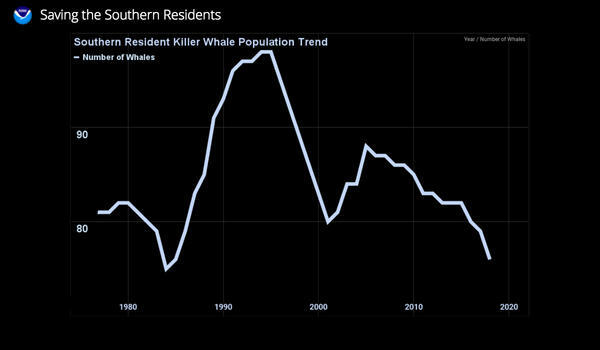 The population of genetically-distinct resident orcas has dwindled to a critically low level. Deaths outpace births. Only 76 remain as of the last count. “This is a dangerously low number for a species that is already endangered under the federal Endangered Species Act,” Jeff Parsons of the Puget Sound Partnership said at a legislative hearing in Olympia earlier this month. ”We’re at a critical juncture with orcas and we need to act now if we’re to save the species,” added Bruce Wishart, a Sierra Club lobbyist. 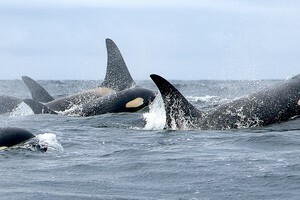 The resident killer whales face three main threats topped by lack of prey. Their favorite food is Chinook salmon, which is also dwindling. Then there’s disturbance from vessels and underwater noise. A third threat is toxic pollution in the water and marine food chain. So is this dwindling population doomed? That’s what Barre is hoping happens again now that the federal and state governments have complementary recovery plans. 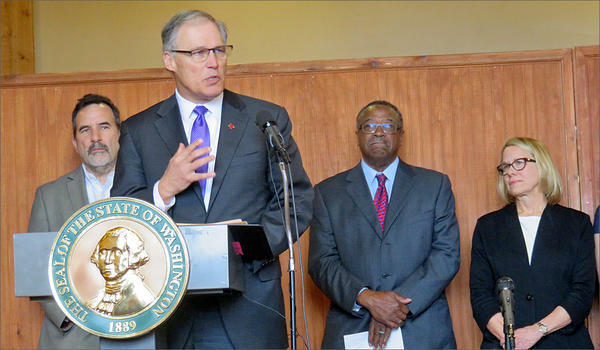 Inslee on Wednesday signed an executive order directing seven state agencies to take a wide variety of short and long-term actions. Inslee described near-term elements to the state’s orca recovery plan. The Legislature provided a modest sum to pay for these in its just-completed session. First, make more food available for the killer whales by increasing salmon hatchery production by up to 5 million extra fish. Second, provide quieter waters and consistent separation from boaters by deploying more marine enforcement patrols. Third, provide cleaner waters by treating more storm water runoff. Inslee handed off potentially more painful measures to a newly created Southern Resident Killer Whale Task Force. They’ll get to wrestle with questions such as whether to introduce vessel speed limits for noisy tankers and ferries. Plus, should commercial and recreational salmon fishing be curtailed to leave more food for the whales. And even whether farm and water use practices in Eastern Washington should change to benefit salmon and, by extension, orcas. The Canadian government has proposed or is taking similar actions on increased salmon hatchery production, fishing restrictions and vessel slowdowns. 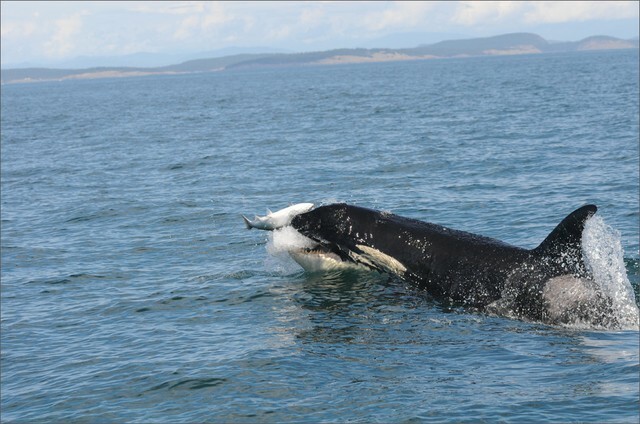 The endangered orca population routinely crosses back and forth across the maritime border with British Columbia. Two brothers from the Lummi tribe sang a whale song at Inslee’s task force announcement held at a Seattle park overlooking Puget Sound. Suquamish Tribal Chairman Leonard Forsman said he can hear the orcas calling for help. Forsman said Northwest tribes are glad to see action to prevent extinction. Washington’s Department of Fish and Wildlife says it could take a long time to confirm a turnaround in the killer whale population trend. In the shorter term, things to look for include whether you see fatter orcas. And how many calves are born and survive. 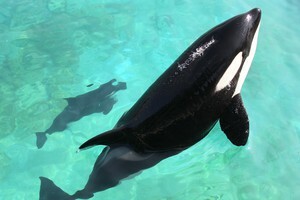 Endangered Orcas Are Starving. Should We Start Feeding Them?